Statistics from the Anxiety and Depression Association of America (ADAA) show that 40 million adult Americans suffer from anxiety disorders. This equates to 18% of the population and makes it the #1 mental illness in the U.S. Although it is eminently treatable, only 37% of sufferers receive treatment. Prescription drugs and therapy are typical treatments, but now, CBD is being touted as a potential cure for anxiety. What Are The Existing Anxiety Treatments & What Are Their Side Effects? There is certainly no shortage of available treatments and, even though a large percentage of people don’t look for help, tens of millions do. You probably won’t be surprised to learn that prescription medication is by far the #1 treatment option. According to Anxiety Centre, anti-anxiety drugs have been doing remarkable trade for years. Back in 2002, the two most common anti-anxiety drugs, Zoloft, and Paxil were in the top 8 most prescribed medications in the United States. While they are no longer in the top 10, anti-anxiety drugs such as Xanax, Valium, and Ativan remain incredibly popular. Perhaps more worryingly, an estimated 1-in-6 Americans take a psychiatric drug such as a sedative or an anti-depressant according to Scientific American. The efficacy of prescription medication has long been debated. An increasing number of scientists and medical professionals believe that the side effects are not worth the risk when compared to any positive impact of the drugs. Despite the obvious problems, medical professionals routinely prescribe these medications as an opening step. With such easy access to pharmaceutical drugs, it is no surprise to hear about the horror stories surrounding these drugs including misuse, tolerance, and side effects. Another major problem with anxiety is that it can exacerbate physical ailments. Aside from common problems associated with anxiety such as an upset stomach, people who suffer from the condition are at a greater risk of suffering from a variety of chronic health problems. Anxiety has even been linked to conditions such as gastrointestinal problems, heart disease, and respiratory problems. It is also linked with substance abuse; especially alcohol or illegal drugs as anxiety sufferers seek an escape. If an anti-anxiety drug is either ineffective or results in serious side effects, you may think you have nowhere to turn. Thanks to a major change in legislation regarding industrial hemp, all that is about to change. CBD is one of the dozens of cannabinoids found in marijuana and hemp plants. It is a naturally occurring substance, and an increasing number of companies are finding ways to extract the CBD from plants. Moreover, these firms can use CO2 extraction to create oil rich in CBD but contain little or no THC; the psychoactive compound banned in so many places. As a result, CBD oil is classified as a food supplement as long as it contains less than 0.3% THC which means it is legal for sale all across America. 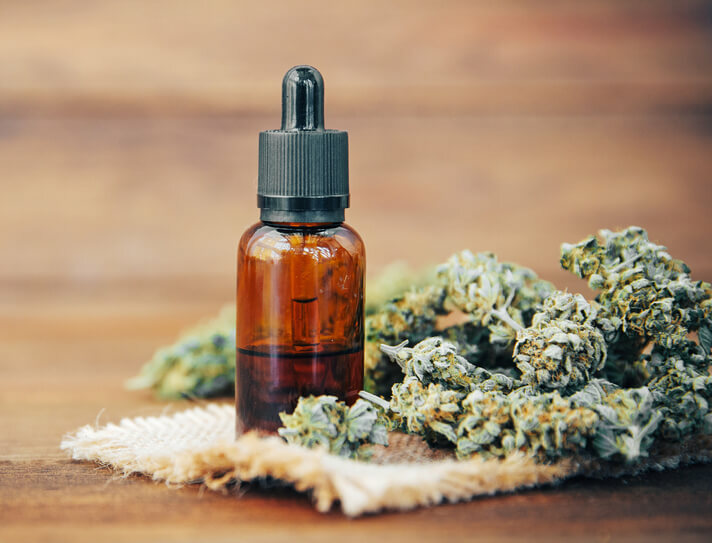 Major pharmaceutical companies are growing uneasy at the sudden popularity of CBD oil, and we expect these organizations to purchase stakes in this burgeoning industry ultimately! The theory behind CBD oil and its ability to cure anxiety is as follows. CBD works with a brain receptor called CB1. A ‘receptor’ is a tiny protein attached to your cells that receive chemical signals from varying stimuli to help your cells respond. Research relating to the impact of CBD on the CB1 receptor is ongoing, but there is a prevailing belief that it has a positive effect on the body’s serotonin levels. As you may be aware, serotonin is an important chemical regarding mental health. It is common for people with depression to have low serotonin levels, and it can also cause anxiety. It may take years for detailed research to prove that CBD can help anxiety conclusively but early results are positive. After early animal studies showed encouraging results, a 2011 study published in the Journal of Psychopharmacology showed that CBD helped human patients with SAD. In the study, participants received a placebo or 400mg of CBD. Those who took the CBD reported decreased levels of anxiety. Another report, published in Neurotherapeutics in 2015, said that preclinical evidence supports CBD as a treatment for SAD, PTSD, OCD and several other disorders associated with anxiety. Which CBD Oils for Anxiety are Best? Don’t make the mistake of believing that every seller of CBD oil is reputable. In rapidly growing markets, there is always a fair share of shysters and the CBD oil industry is no different. As a result, we have taken the liberty of finding the best CBD oils for anxiety. Check out which CBD oils work on our CBD Oils for Anxiety Comparison Chart. Initially, the only evidence we had as to the efficacy of CBD when curing any ailment came from animal studies. In the last few years, however, an increasing number of reports are getting published in respected journals, and they show a positive impact on humans. The social and financial costs of anxiety disorders in the United States are billions of dollars annually so it would behoove us to treat CBD with the seriousness it deserves. While more research is needed, countless individuals have already attested to the effectiveness of CBD for anxiety.